Download the PDF version (428 KB) of this content. Sectoral Profiles provide an overview of recent labour market developments and outlooks for key industries, for various regions of the country. Accounting for about 3% of the Western Canada and Territories' gross domestic product (GDP), the information, culture, and recreation (ICR) sector employed approximately 258,000 people across this region in 2017. After experiencing a steady decline for several years, growth in this industry has improved in the past couple of years primarily due an improvement in the economy leading to an increase in discretionary spending. Going forward, the outlook for the information, culture, and recreation sector remains positive as the economy continues to grow. The information, culture, and recreation (ICR) sector has two segments: information and cultural activities; and arts, entertainment and recreation activities. The former includes: book, newspaper and software publishing; motion picture and record production; telecommunications and broadcasting; data processing and hosting, and Internet publishing. The latter part contains: cinema, performing arts and sports spectator establishments; museums and historic sites; amusement parks and casinos. In 2017, the entire sector employed approximately 255,000 people in W-T-Region, mainly concentrated in British Columbia (53%) and Alberta (29%). While employment is relatively evenly split between the two segments, the information and cultural segment accounts for a larger share of economic output because it contains more high skilled occupations that produce additional value for every hour worked. In BC, ICR represented over six per cent of all employment for the Vancouver area in 2017, and more than four per cent in Victoria and southern BC. 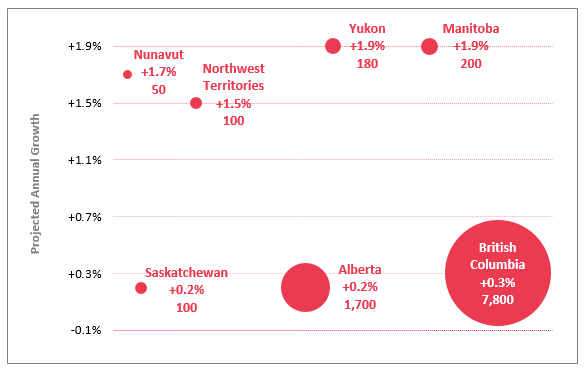 In Yukon, the sector employed 5.7 per cent of all workers in 2017, while across the prairies, ICR registered above four cent of all employment in Calgary, Regina, and Winnipeg. Over half of the region's employment in the ICR sector is contained in two sub-sectors: Amusement, Gambling and Recreation Industries (38%); and, Broadcasting and Telecommunications (17%). Of all the subindustries, Telecommunications produced the most output in 2017 – generating 52 per cent of the sector's GDP. The next largest groups were Amusement, Gambling, and Recreation Industries and Publishing industries (except internet), both producing 13 per cent. In the western provinces, this segment employs 97,500 workers, representing 1.6% of employment across all industries. Broadcasting employment declined 25% between 2007 and 2017. Telecommunications saw steady GDP growth over the past decade, reaching just over $11 billion in 2017. Improved employment in 2017 - up 16% in the western provinces. Information Services - which includes Internet publishing - continues to grow. Segment contains web hosting, video, and audio streaming services. Employment in western provinces (33,100) for this segment has doubled since 2014. 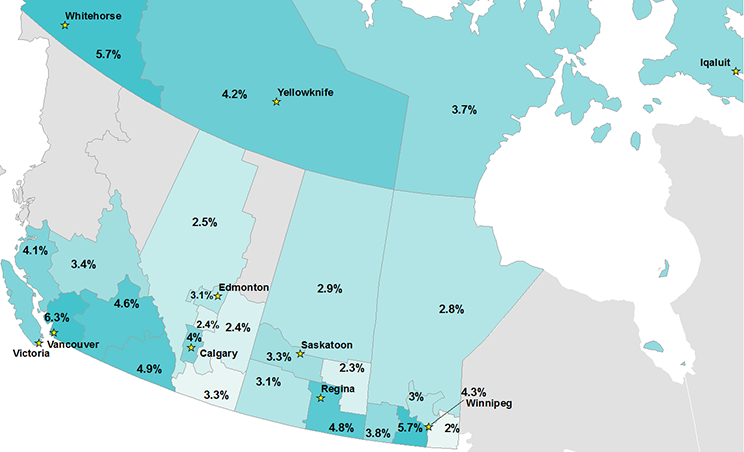 Jobs in the region are primarily in B.C. (80 %). Employment patterns fluctuate annually - around 20% up or down over the past decade. Employment in the western provinces has been improving over the last five years, up 27% between 2012 and 2017. Segment buoyed by stronger consumer spending and more international tourists. Declining employment in traditional newspapers and books. Software publishing produces the majority of output (64%) in this segment, while having less employment than traditional forms. 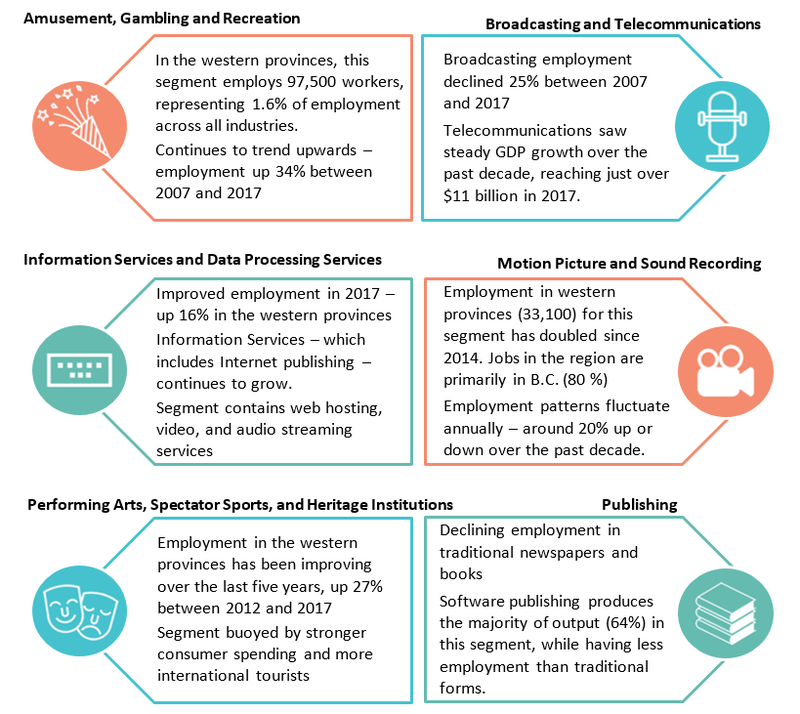 All Western Canadian provinces will experience employment growth in information, cultural, arts, entertainment, and recreation services between 2018 and 2020. British Columbia has the largest projected employment increase at 7,800, followed by Alberta with an increase of 1,700. Among the territories, Yukon and the Northwest Territories should see the largest employment growth (+180 and +100 respectively) over the forecast period, while Nunavut will also see a slight boost in employment (+50). Manitoba and Saskatchewan should see modest employment gains in ICR between 2018 and 2020 (+200 and +100 respectively). Note: The territorial forecast represents employment for "tourism and culture". x: suppressed to meet the confidentiality requirements of the Statistics Act. Click the map to see it full-sized. Data for areas in grey is suppressed to meet the confidentiality requirements of the Statistics Act. In preparing this document, the authors have taken care to provide clients with labour market information that is timely and accurate at the time of publication. Since labour market conditions are dynamic, some of the information presented here may have changed since this document was published. Users are encouraged to also refer to other sources for additional information on the local economy and labour market. Information contained in this document does not necessarily reflect official policies of Employment and Social Development Canada. Prepared by: Labour Market Information (LMI) Division, Service Canada, Region of Western Canada and the Territories. For further information,please contact the LMI team.